Shola craft or Sholar Kaaj, a centuries old folk tradition peculiar to West Bengal is the art of making delicate decorative objects from the soft, porous, light and supple pith of the shola stem. 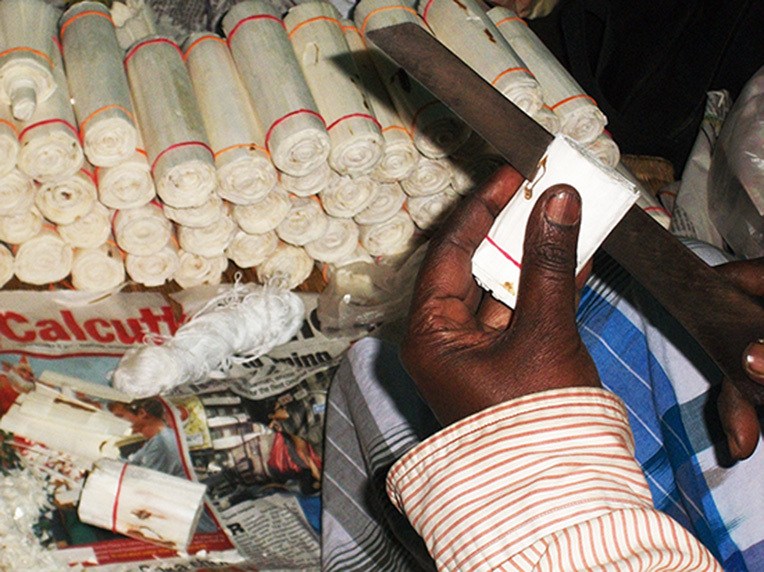 Shola pith items form an integral part of the major religious rituals in West Bengal. Its light weight and resistance to decay from water also made shola an ideal float for rural fishing nets. It is also the material that provided protection from the sun in the form of the famed shola (often mistakenly referred to as "solar") hats. Shola or shola pith, which bears the botanical name `Aeschynomene Aspera` is a tall, erect, perennial swamp plant which grows wild in the marshy regions of Bengal, Assam plains, the lower region of Orissa, Andhra Pradesh and Tamil Nadu. It is also known as Indian cork. The chief virtue of the shola plant is its very light, pith like, spongy wood of the large mature stems, its whiteness and the polish of its grain which makes it look like alabaster. The stems, submerged in water, are very stout, 2" to 3 ", compared to the rest of the plant. There are two species of shola: kath shola and bhat shola. Kath shola is rather hard but bhat shola is light in weight and soft. Good quality pith is white, smooth and soft and no nodes. The best time to harvest the Shola plant is in winter when the plant is mature. If the plant is cut down before the flowering period, it affects the whiteness of the pith. On the other hand, if the plant is cut down after a long period of flowering, it becomes hard and reddish in colour. 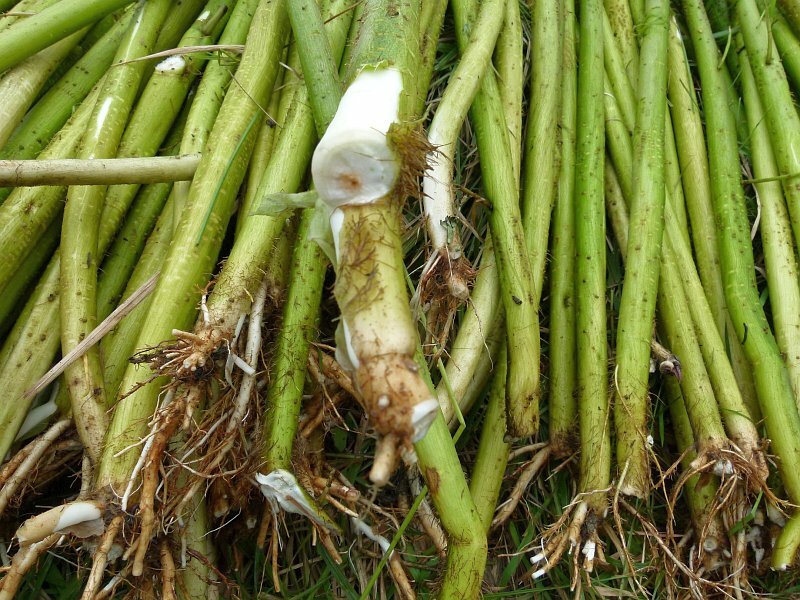 The uprooted plant is stripped and the stem is trimmed and cut into two or three segments. These are then dried under bright sunlight for 3-4 days. The stems gradually turn brown and become lighter. The shola is now ready for storing or for immediate processing. The brown outer skin is peeled off to reveal the soft core. There was a time when the Malakars, the traditional Shola pith artisans, enjoyed a respectable position in rural society and were included in the nine artisan classes of Bengal. (The Malakar is traditionally a maker of garlands). They use to supply garlands (chandmalas) and flowers for village deities and religious functions in the village. 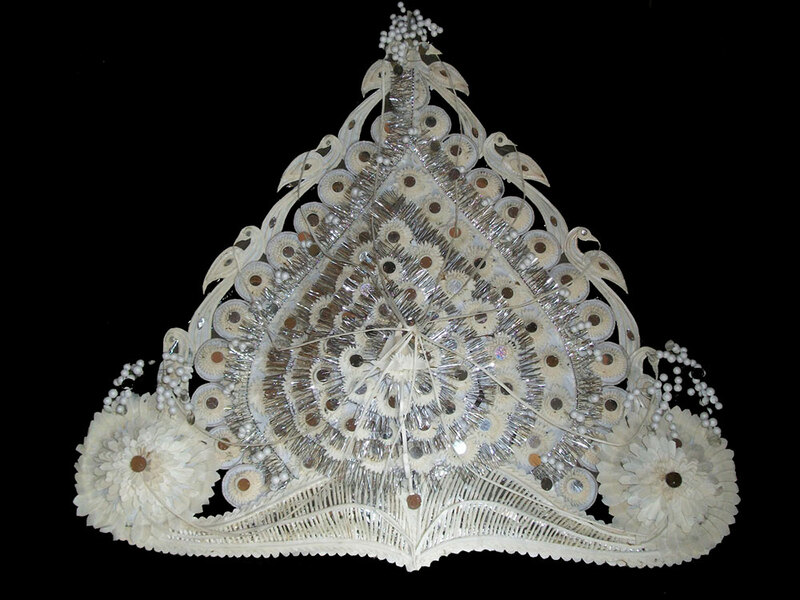 No marriage could be celebrated without the ornamental shola headdress for the bride and groom made by village Malakars. The craft went through a major shift after World War II and later, the abolition of the zamindari system. The "Daaker Shaaj" of the Durga images in the zamindari pujas were decorated with silver foil and baubles which were arrived by post ("daak" in Bengali) from Germany. With the outbreak of war, these imports stopped and Shola began to take precedence as the material of choice for the deity`s backdrop ornamentation. The end of the zamindari system saw a surge in public Durga pujas which gave further impetus to shola crafts. Today, a great number of shola craftsmen earn their livelihood by making ornaments for idols. In the last few decades, shola pith handicrafts have found a wider application in home décor, as artistic objects. Many of these art objects fall into the category of fine art, not folk art, taking up the space once occupied by fine ivory craft. The soft pith has been used to create statuettes, idols, children`s toys, models of flowers, exotic display objects like elephant-howdahs, peacock-boats, palanquins and a host of other objects. No part of the Shola pith is wasted and leftover bits are used for making various designs of flowers, birds, and animal figures. In appearance, Shola crafts look quite similar to the expensive ivory items and most of the decorative objects are inspired by the ivory carvings of Murshidadbad. The finest examples of craftsmanship are however seen on the huge ornamental backdrops made for the image of the goddess during Durga Puja celebrations. Craftsmen spend months on these superb works of art painstakingly carving out each detail. Artisans, with their special iron blades or `kath`, fashion intricate objects out of the shola.  The soft core is first cut into pieces of various lengths as required. It is then sliced into paper thin strips termed ‘paturi’ or shaved into sheets termed ‘kaap’ and then shaped by the artisan. Shapes of different sizes are cut and joined together to make various objects. Flat sheets are rolled together tightly to form a block. Using his creativity, the artisan then makes serrated blocks of shola which can be further cut to create geometric or floral shapes. The process is simple, but the craftsmanship requires a steady hand and great dexterity. For toys and dolls and other forms, plaster moulds are used where shola sheets are pressed to shape and layers of paper are pasted at the back for reinforcement. Shola craft could be either a folk art or a fine art. Where artisans make intricate shola "models" inspired by ivory art, like images of deities, buildings, boats etc, these would fall into the category of fine art, consumers of which are usually urban. Shola folk craft comprises those items which have traditionally been used by rural societies. Both men and women involved in these shola creations for various religious and social ceremonies through the year, which include garlands, specific floral shapes for specific goddesses and wedding head gear. Thus beginning with kadam flowers made to usher in the Bengali new year in the month of Boishakh (April-May) to Shola decorated masks to be used during the Gomira ceremony at the end of the year during Choitro Shankranti, there is a constant demand for shola folk art, varying with community and season. Poorer households often use a small shola image instead of a clay image to represent their tutelary deities (bastu/griho devata). Wedding headdresses extend beyond that for the Bengali Hindu bride and groom: they are also made for adivasis and Rajbongshis while sehras for Muslim grooms are made of shola instead of flowers. Shola craftspersons in the various districts have specialized in particular forms of expression. The artisans of South 24 Paraganas are noted for their beautiful chandmalas (garlands), topors (wedding headdress) and other forms of floral designs. The artisans of Bankapasi village in Bardhaman district are noted for their extraordinary Daaker Shaaj ornamentation for the goddess Durga. 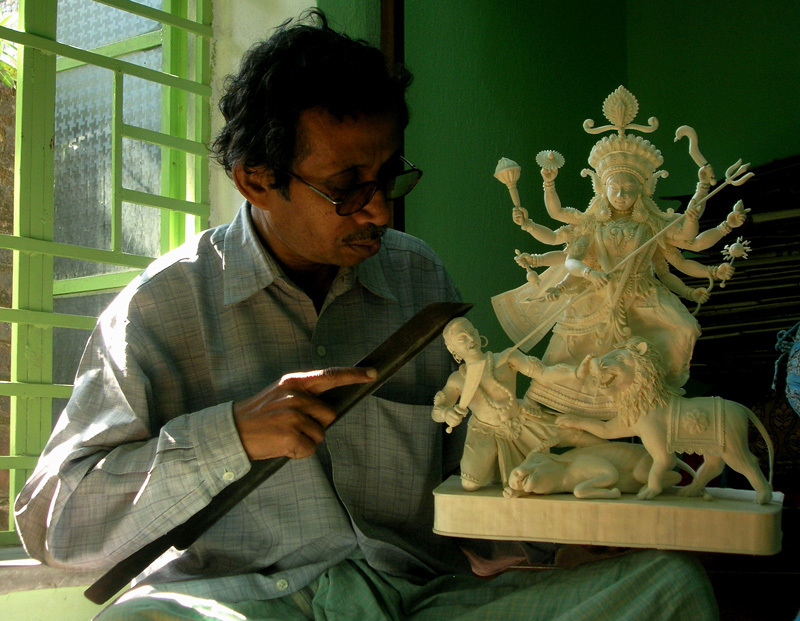 The artisans of Kirnahar in Birbhum have earned a name for making shola images. Murshidabad city is famous for its exquisite models of boats and animal figures. The Malakars of Dinajpur and Cooch Behar have also been creatively using shola to make masks for Gomira /Gajon celebrations as well as the ornamental Duldul (Imam Hussain`s horse) used in Muslim rituals. The lantern like the cylindrical Mellis andthe square Manjushas painted with bright colours are used for the worship of the goddesses Manosha and Chandi. 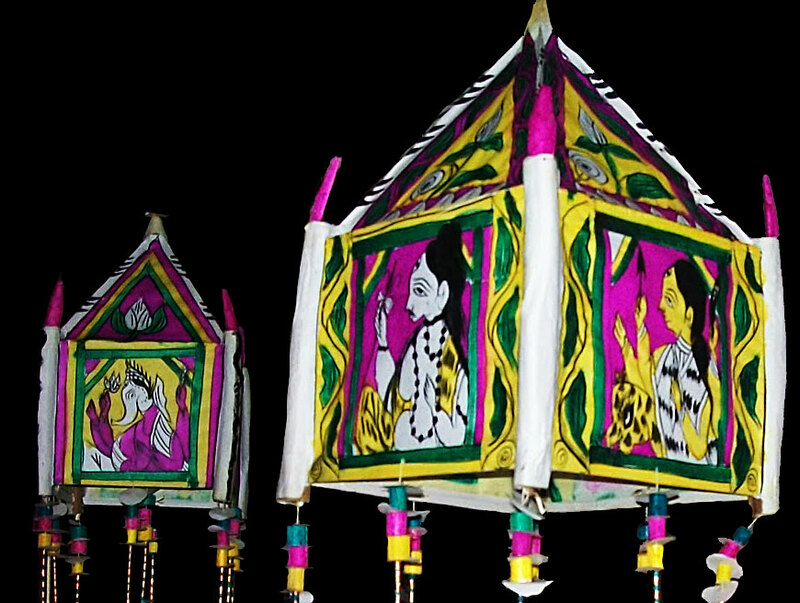 Some artisans from Dinajpur and Malda have actually converted these ritual decorations to lanterns for home use. The Rajbongshi community of North Bengal also carve Mashan dolls to ward off evil spirits. They also use shola to create abstract ritual images representing goddesses Manosha and Shaitol. Today, many other communities are involved in working with Shola, other than the Malakars. Making shola decorations came into vogue only about 30 years ago. This craft has also recently gained attention in the global market. Craftsmen in West Bengal mainly cater to the export market by producing large quantities of artificial flowers of various kinds with shola. These are used for gift wrapping and decor and Christmas decorations for Western markets. Exquisite models of jasmine, rose and chrysanthemum are made. Due to rising demand, Shola craft has become an agro-based industry and shola farming has also spread. Where the reed used to be handpicked by craftsmen in earlier times, it is now bought from the market. This cottage industry, which is low-capital and pollution-free, is gradually making inroads into many homes in many villages and its future, looks promising. On the downside however, there is a danger of a booming real estate scene in the districts rapidly destroying wetlands, while only a handful of truly skilled traditional shola artists remain.